After getting off to a slow start (compared to some other chickens I happen to know), my hens are now regularly laying eggs! 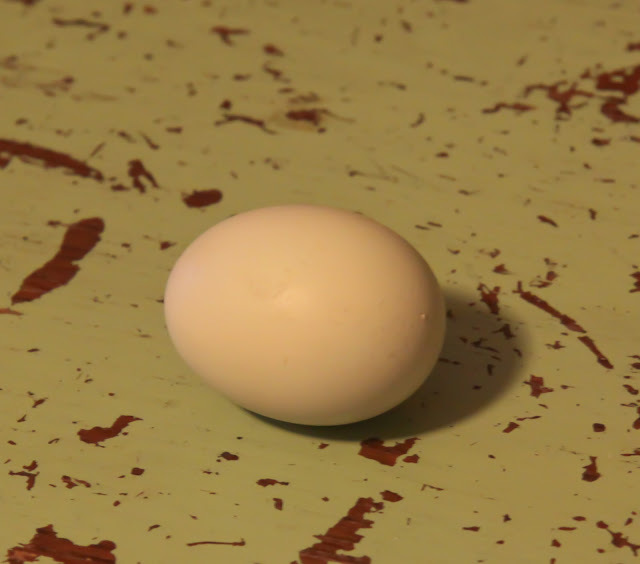 The Brown Leghorn lays white eggs. The Dominique, Silver Laced Wyandotte and Rhode Island Red all lay light brown eggs. 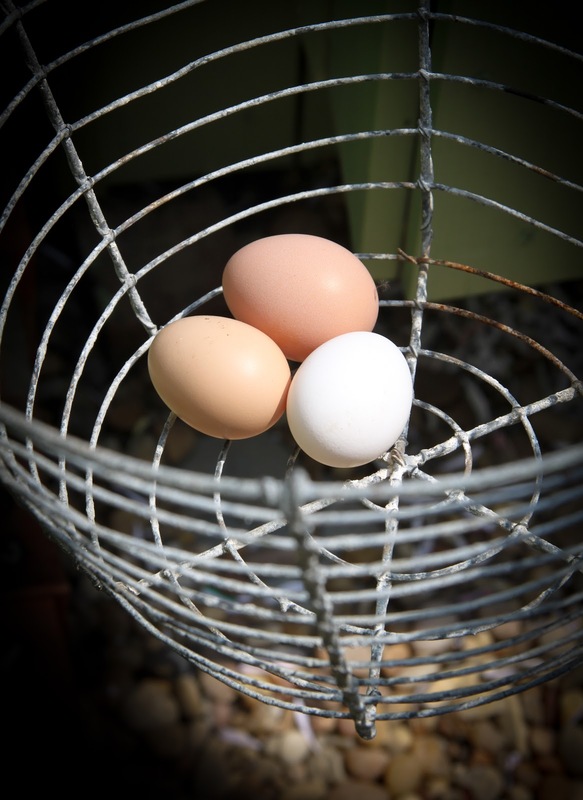 The Americauna (nicknamed an "Easter Egger") lays GREEN eggs and the Welsummer contributes a lovely, rich dark brown egg with...(be still, my heart)....SPECKLES. June Carter's first egg...hard to tell but it is definitely green! It took a little time to get the nesting boxes just right for the girls. At first they preferred to squeeze under the very short ladder that leads to the aviary for laying their eggs rather than using the nice, cozy and EASILY ACCESSIBLE nesting boxes Michael carefully constructed for them. My chicken keeping neighbor suggested that I put a cardboard box in each of the nesting boxes so that the girls would feel more enclosed and secure. When Michael brought home a bushel of cucumbers from our farmer's market for pickle making, we realized the boxes would fit just right so we gave it a go. Another friend brought us a grocery sack of hay to line the boxes and the very next day we found six eggs (from six hens) laid neatly right where we had hoped. No more climbing into the coop on my hands and knees to hunt for eggs hidden under the ladder. Here are some shots of our first eggs. I can't even begin to tell you how exciting it was to find them. 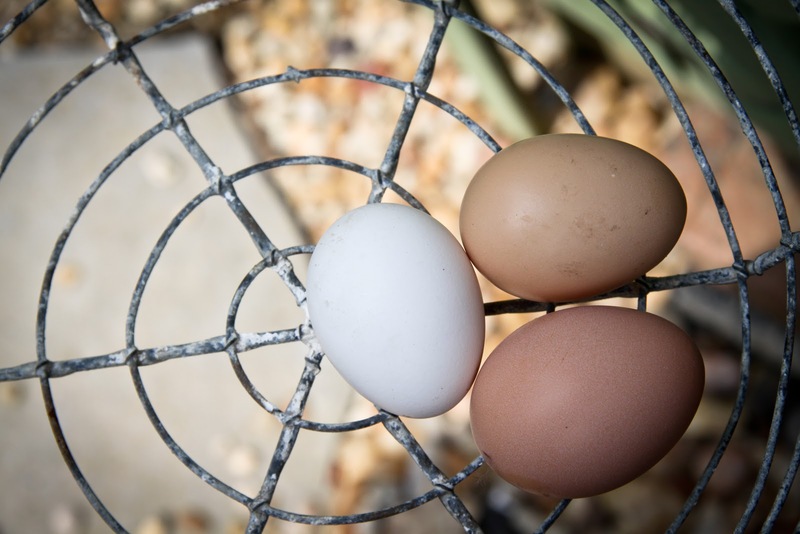 Did you know that you do not need to have a rooster to get eggs? You DO need to have a rooster to have fertilized eggs. Chickens lay about an egg a day except in the winter when egg production drops significantly. Some commercial egg operations keep lights on in the coops in the winter to trick the girls into laying more eggs but the fact is a chicken will only lay so many eggs in a lifetime and once she's laid them, she's done. Tricking your girls into laying more in the winter just wears them out early. One of our chicken keeping goals was to have a "zero waste" yard and so far, so good! We live in a neighborhood full of large, old oak trees. Leaves in the fall are abundant, to say the least! Last fall, we saved a number of bags of oak leaves and that is what we have used (shredded) as the bedding in our coop. When we mow our lawn we either mulch the clippings back onto the lawn or we bag the clippings and feed them to the chickens. They LOVE grass clippings. We were all ready composting leaves and kitchen scraps but I have never composted weeds. I did not want weed seeds in my compost. Now I feed all the weeds to the chickens. The greens are very good for them and they must taste great because they go crazy when they see me coming with a bucketful. When we remove soiled bedding from the coop or aviary we put it straight into the composter and then in a few weeks time it is ready to be added to the vegetable and flower garden. 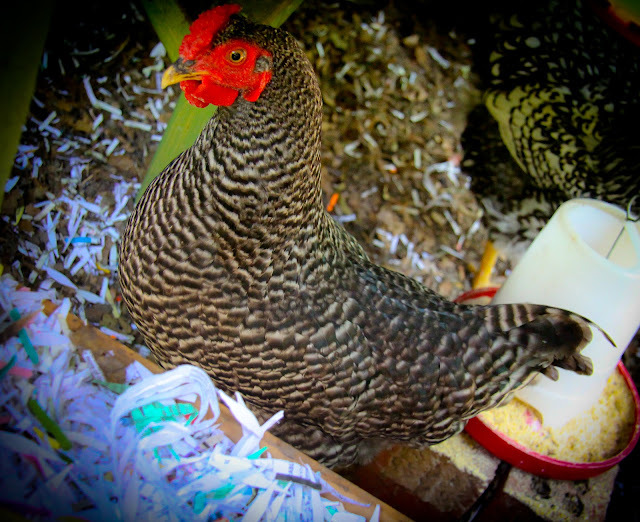 We feed the chickens most of our kitchen scraps but what they don't care for goes into the composter. It decomposes much more quickly now...the chicken poo really keeps the composter hot. So there you have it...we have no yard waste anymore and the "waste" the chickens create is a much better fertilizer than any chemical fertilizer we could buy. All of that plus fresh eggs and a whole lot of entertainment.